The hobby bug has really bitten me again and not in the least due to the inspirational work of others out there on the blogspot. I've been on the look out for a new mini which will serve as the basis for a new captain for my Relictors. I was already tempted by Sicarius, but I was very uncertain about which bits were and weren't attached to the body. But a couple of days ago I caught a shot of a blister pack on Ebay as well as Ron's amazing Ravenguard captain based on the same model (link) and I was sold. So some searching on Ebay netted me a Sicarius for about 60% of the normal price and I am certain I can find an Ultramarine fan out there who will be interested in the left over iconography and bits. So in a couple of weeks I will finally be able to put together a new, worthy leader for my rabble of borderline renegades! Further news concerns the Kill Team rules, orginally released by fellow bloggers and hobbyists Arkaedin and Dictator (and with the help of a broad range of others) in the early editions of the Astro Mag. As I said in my previous post, plans are in the making to update the rules for this fun and quick minigame for 40K. So anybody out there interested in having a gander, reviewing some rules or just looking for an alternative way to get a quick 40K-themed skirmish game in go check out the latest suggested updates - here. And no, not just because I've put some time and effort in so far. I'm taking so much interest in this update and the rules in general due to the huge potential, both game- and hobbywise. As a student and part-time lab-assistent my free time is limited and precious, which means it bottles down to a combo of miniature gaming, the odd console game and much needed sleep. So when I do get around to 'playing with my plastic soldiers' I tend to get overambitious, planning massive armies that will never see the light of day. In fact I have many a bits box set aside for a particular project that is very unlikely to ever happen. The rules for Kill Team provide, at least for me, a very fun, different and fairly fast-spaced way of approaching the 40K hobby. Not only will it allow me to get a couple of fast, fun games in, it also enables me to try out stuff from other codices. As well as, the real kicker for me, the frantic converter and skirmish game fan inside me will be able to go all out on a small range of minis (5-10) that will both give a real sense of completion once finished, but will also allow me to jump all over the place with every new team! So if anybody out there has ideas or suggestion don't hesitate to mention them. Everybody who helps out will naturally be credited and together we can add yet another approach to an ever growing hobby! 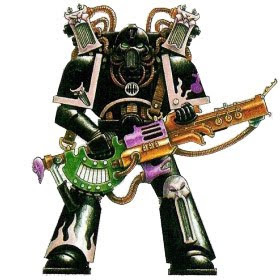 More news on Kill Team (including a potential namechange, more ideas for missions and perhaps even a re-emergence of the GW nemesis rules) as soon as there are new developments. More updates on these guys later this week, so stay tuned and thanks for reading! Looking forward to seing more of those nicely painted but painfully yellow marines Heph.